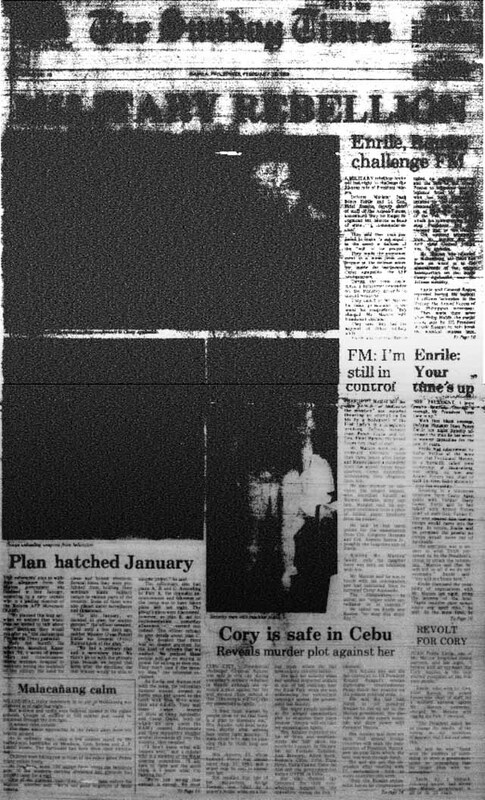 Remember what the front pages of Philippine newspapers looked like during the 'bloodless' revolution that toppled a dictatorship in 1986? CHRONICLES. 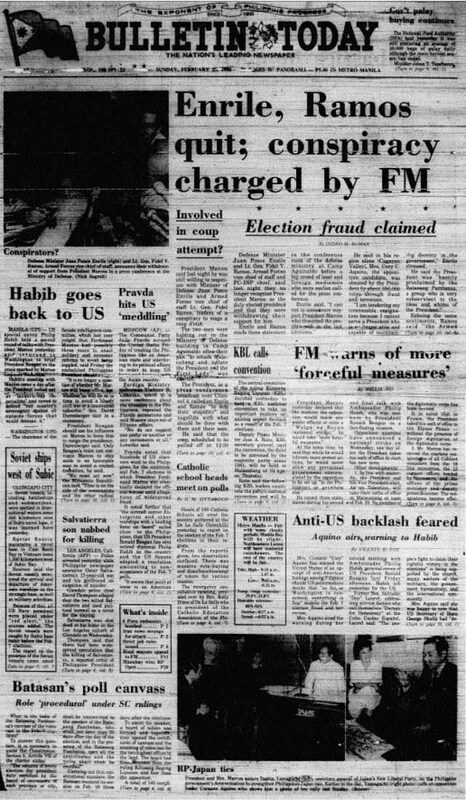 Events throughout the People Power Revolution in 1986 grace the front page of newspapers. Photo by lifted from the book Bayan Ko! 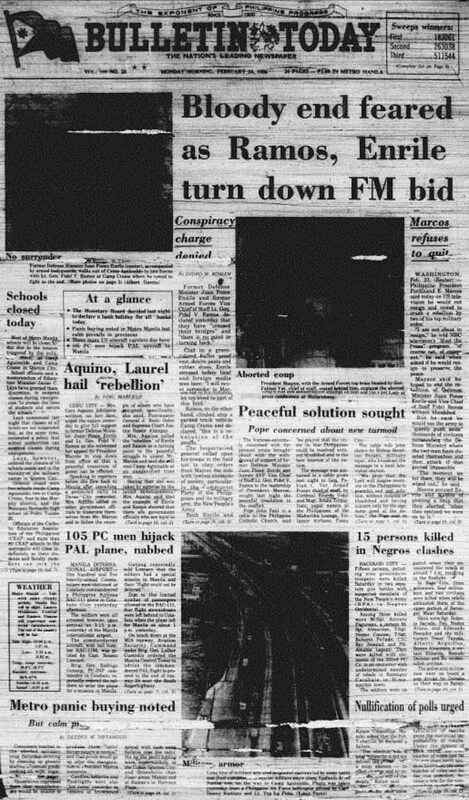 MANILA, Philippines – Philippine media played a big role during the People Power Revolution in 1986. 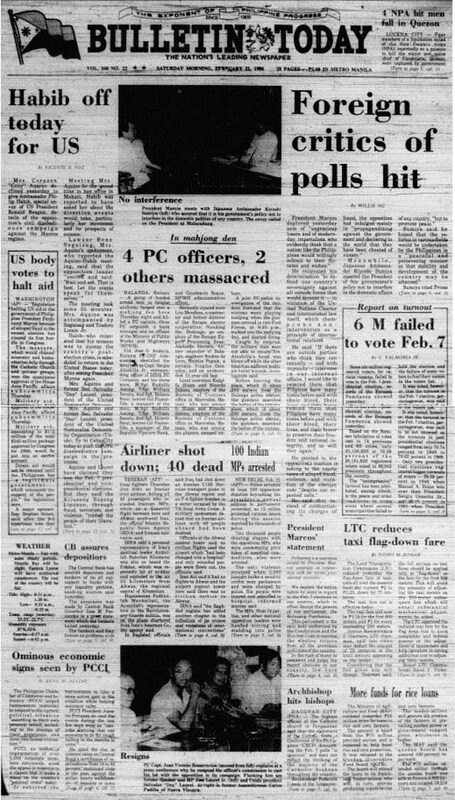 The country's newspapers chronicled the events that transpired from February 22 to 25 which ended the 21-year rule of then dictator Ferdinand Marcos. 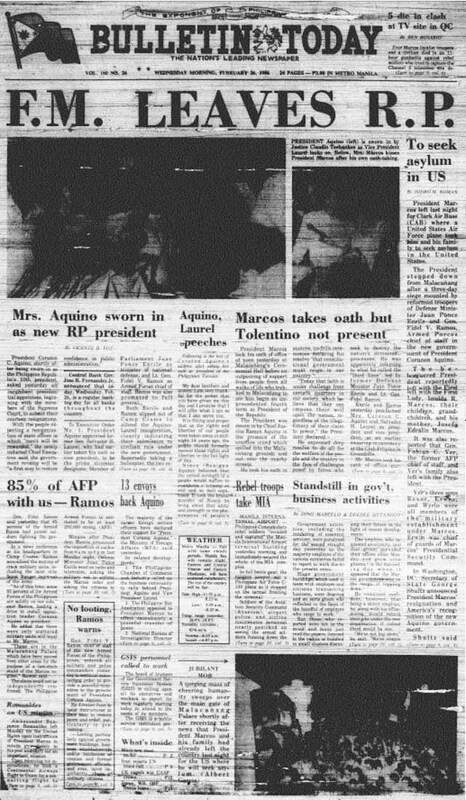 On the anniversary of the uprising, Rappler looks back at how the front pages of Filipino newspapers – the Philippine Daily Inquirer, Bulletin Today (now Manila Bulletin), and the Manila Times – looked like throughout the 4-day "bloodless" revolution that ultimately led to the toppling of the dictator. Note: Swipe left or right on the photos to navigate. 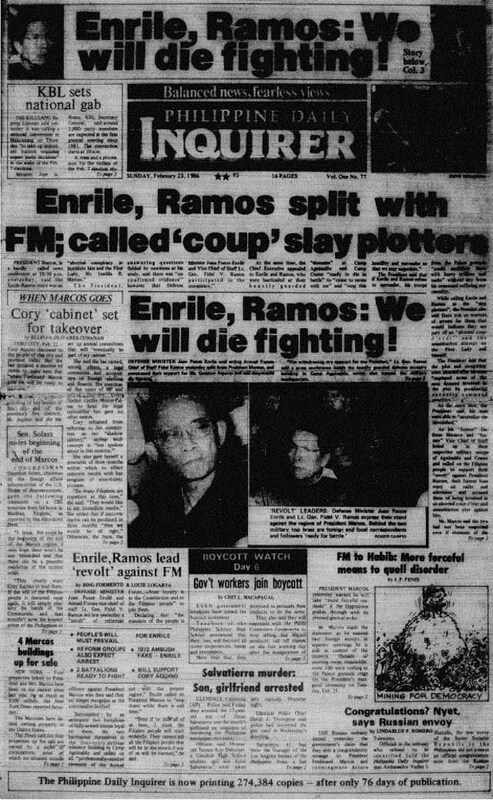 Former Armed Forces of the Philippines (AFP) Vice Chief General Fidel V. Ramos and then defense secretary Juan Ponce Enrile announced they had withdrawn their support for Marcos. Former Manila Archbishop Jaime Cardinal Sin, over Radio Veritas, asked Filipinos to leave their homes and support Enrile and Ramos. Thousands of Filipinos responded to Cardinal Sin’s appeal and started to flock and barricade rebel camps. They also brought food and other supplies to the soldiers. Ramos called the event “the revolution of the people” as he faced the public for the first time outside Camp Crame along EDSA. 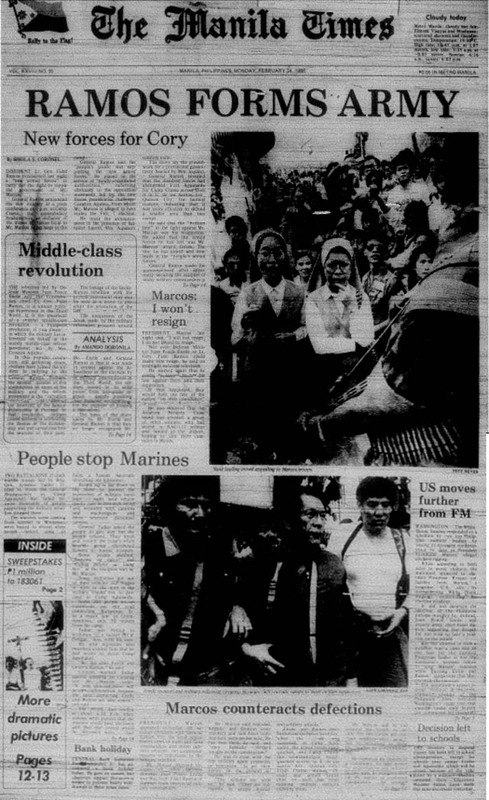 Then General Artemio Tadiar threatened to open fire at the crowd blocking his large marine contingent headed to the rebel camps. The people responded by singing "Bayan Ko" and even offered cigarettes and breads to the soldiers. 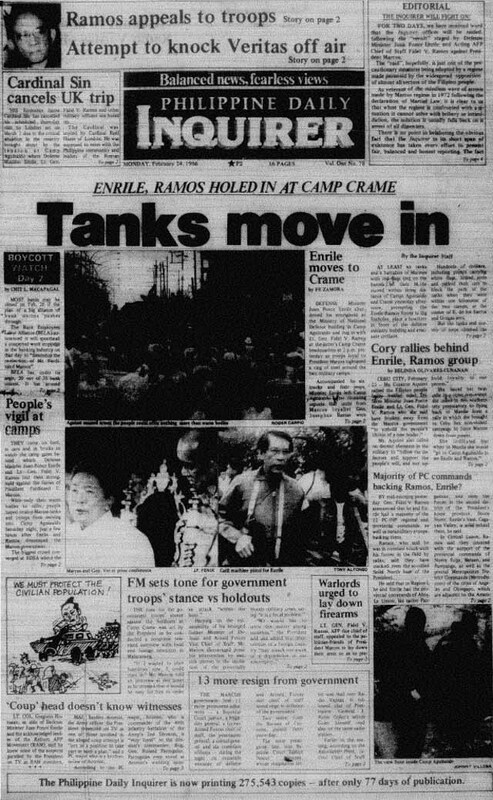 Marcos, rejecting Enrile’s plea to stop tanks, offered him absolute pardon. 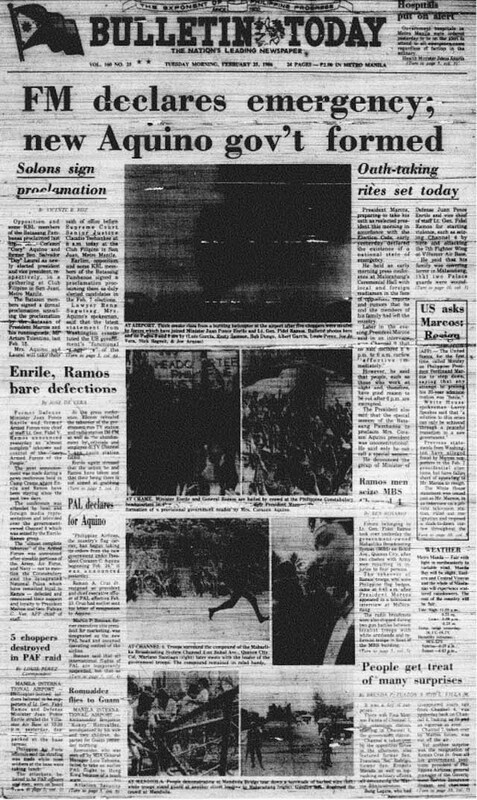 Marcos received a letter from Pope John Paull II, delivered by then Papal Nuncio Bruno Torpigliani, requesting a "peaceful resolution" to the ongoing crisis. More people converge at EDSA as nuns and priests led human barricades to block armored personnel carriers from entering Camp Crame. 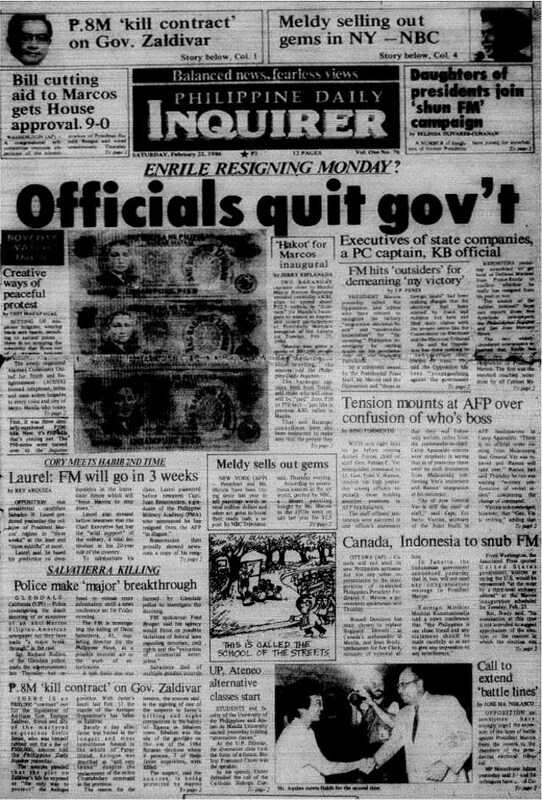 Reagan issued a plea to Marcos to resign as the US endorsed Aquino's government. 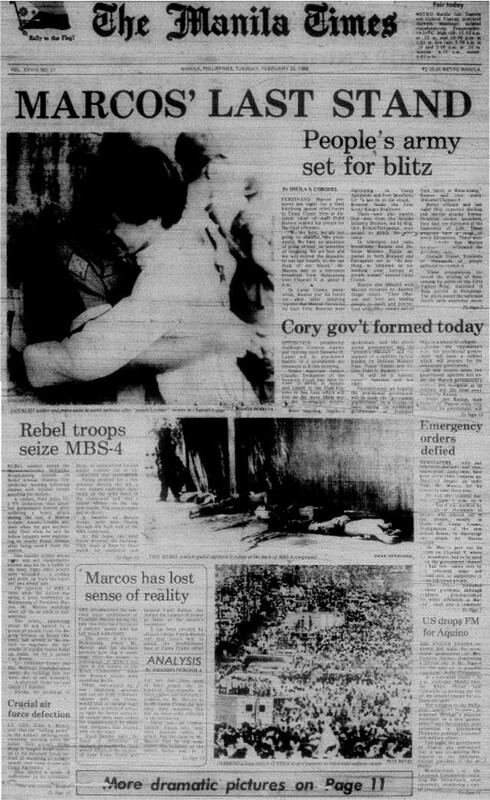 Marcos appealed to loyalists to go to Mendiola to support him and his family. Tension rose as two sides bared plans for presidential inaugurations. Aquino took her oath as president before then senior associate justice Claudio Teehankee Sr at Club Filipino in Greenhills, San Juan. Former Senator Salvador Laurer was proclaimed vice president. 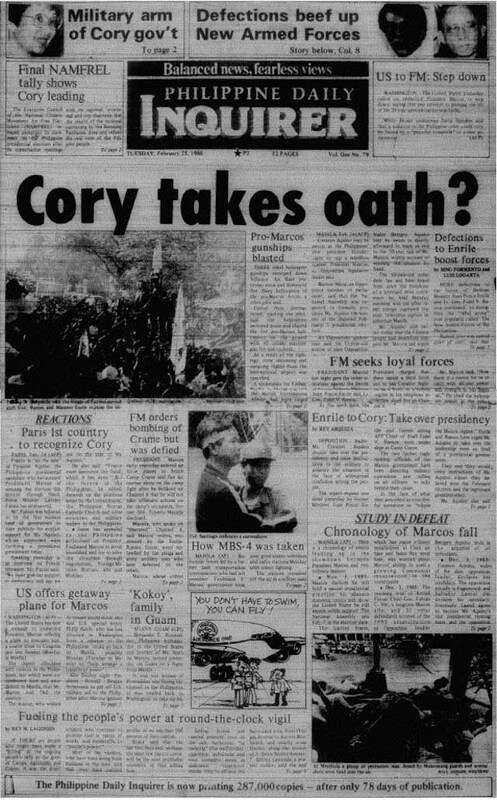 Marcos had his own inauguration in Malacañang with then chief justice Ramon Aquino. He later appeared before 2,500 people with his entire family. 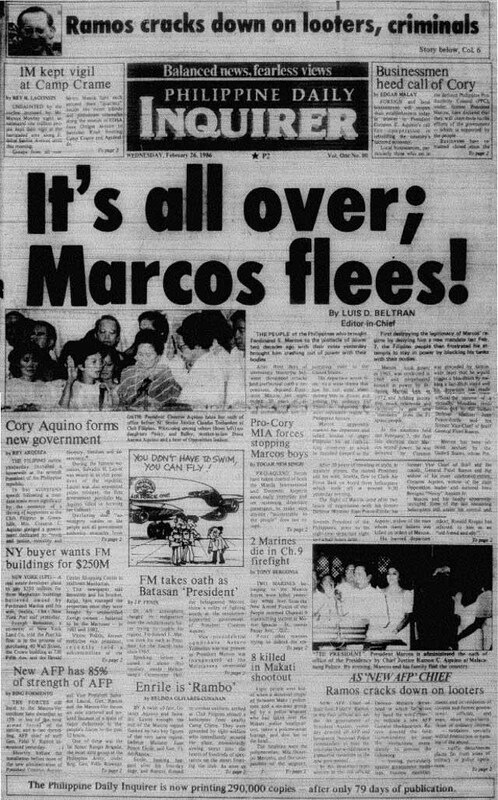 The Marcoses and other government officials left Malacañang and were airlifted to Clark Air Base before taking off for Hawaii with the help of US authorities. 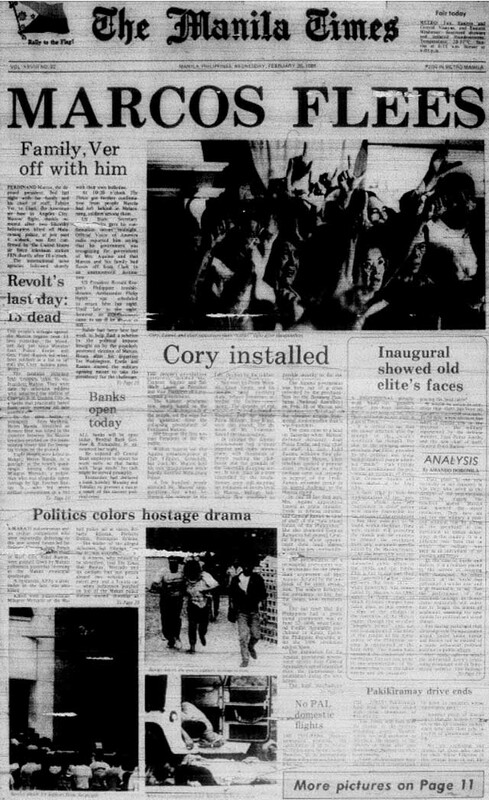 Upon hearing about Marcos' departure, crowds ransacked and looted the Palace. The Marcos family and close allies arrived at Hickam Air Force Base. 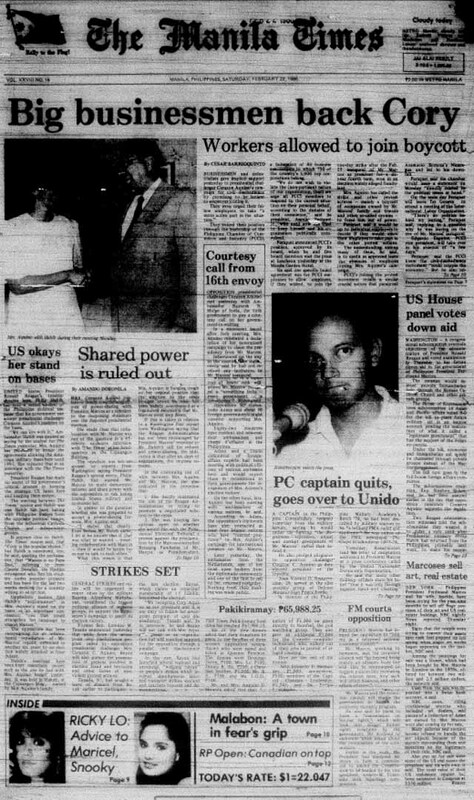 Their arrival marked the start of their exile in Hawaii until Ferdinand's death in 1989 and Imelda's return to the Philippines in 1991 to face charges of graft and tax evasion.